#bjmarine – Last season saw Irish boat sales firm BJ Marine deliver several debut models to new Irish owners and that trend looks set to continue after September's Southampton Boat Show this season too. The Irish boat dealer attended the show with a six strong team from the Malahide, Greystones, Bangor and Malta offices present on the Beneteau, Fairline, Sea Ray and Greenline stands. The Beneteau brand was to the fore in Southampton with yachts exhibited ashore and motor boats afloat. 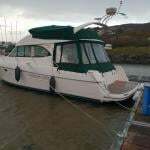 The new models, the Oceanis 55 and in particular, the Oceanis 38 are making big inroadsinto the modern cruising market and BJ report both designs will have Irish owners for the 2014 season. There will also be the first Oceanis 48 in to Ireland in 2014. The MC5 (pictured) also created interest with owners recognising a step up in quality, finish and performance. Fairline debuted the Squadron 48 and Targa 48 with orders for both and BJ Marine do have availability for several models for the 2014 season. One noticeable point for the BJ Marine team in Southampton was the demand for quality used boats. There are both international and domestic buyers awaiting the right boat. BJ Marine's James Kirwan told Afloat.ie "There are new boats coming home, we have marine finance available, we are taking trade ins, there is demand for used boats and the 2013 summer showcased our marine environment better than ever, bring on 2014". #mgmboats – Marine firm MGM Boats from Dun Laoghaire are open for boat brokerage business at this week's Southampton boat show. As part of its continued marketing drive, the Irish firm has eight sales people on Jeanneau, Aquador, Sunseeker stands at the show plus its own dedicated brokerage boats for sale stand featuring over 300 boats. Crewsaver will be showcasing an exciting Drysuit range at Southampton Boat Show 2011. The new collection includes the Sabre, Cirrus, Zephyr for ladies and Razor for kids and have been developed following rigorous testing and feedback from experienced sailors who have trusted our drysuits for years. They are constructed from a high quality 3 layer fabric, TX20K, which offers excellent performance and comfort in all conditions. The highly wicking fabric comprises a tough waterproof and windproof outer, a central breathable layer and inner lining. (MVP: 6,000g/m2/24hrs; WP: 20,000mm). All Crewsaver drysuits have glideskin neoprene neck and cuff seals for easy donning and for optimum warmth and dryness. For those out in the worst of weather looking for a hard wearing, hard working drysuit then the Sabre is the ideal choice. It features an additional storm collar for extra protection against the elements. Additional features include high quality durable zips, integral braces for comfort, Latex socks to ensure warm feet and adjustable cuff and ankle covers for an optimum fit. The features and fabrics of these drysuits provide the highest levels of breathability, durability and comfort you could wish for. All of these combined with new stylish graphics make the Sabre, Cirrus, Zephyr and Razor the only choice of drysuits for surface watersports users. Visit Crewsaver stand B055 for a closer look at our new drysuit range and preview some of the other additions to the Crewsaver 2012 collection. French builder Jeanneau launched its NC11 at the Dusseldorf Boat Show earlier this year and the new model will be on show this Friday at the Southampton Boat Show too. There has been interest in the powerboat model from Irish buyers 'because it is ideal for our Irish waters' according to Hugh Mockler of HM Yachts. 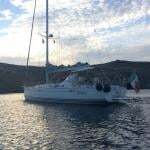 She is easy to handle with her twin diesels and it is also easy to walk forward for anchoring. Below two promotional videos to whet your apetite!